Top left picture is from Peternelj Konrad of Slovenia. As a gesture of longing for peace in the world I like to present art from regions that have been beset by conflict. 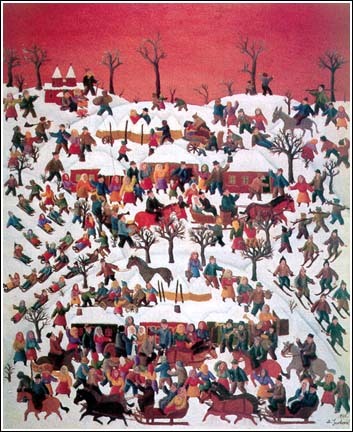 In this spirit, I am presenting naive art from Serbia, Croatia and Slovenia, which were blighted by warfare in the 1990s. Magdeburgerjoe.com and Rudistettner.com continue to strive towards appreciating differences among peoples as well as recognising the universal dimensions of the human experience. I see that visitors come to my website who might never meet each other on the street. I hope that all of the visitors to this site can one day visit each other's countries in times of peace.